Happiness + love + health + financial stability = HOME! Wouldn’t it be nice to help make this formula a reality for local family who is struggling? Please don’t miss your LAST CHANCE to give an online gift to help Habitat for Humanity of Springfield, MO help more families during the Raise the Roof Giving Opportunity. Habitat is challenging you and other loyal supporters to give what you can by making a donation of any size by September 30. Your gift will help Habitat make a life-changing impact on local families. Each of these families is counting on you and Habitat to give them a hand up. And each family is stepping up to contribute what they can to make that a reality. All we need is to hear from you today with your gift to the Raise the Roof Giving Opportunity. Thank you, in advance, for thinking of a family who needs to escape a dangerous, overcrowded or unhealthy home. By helping our partners buy their Habitat home, you provide hope, a renewal and a sense of belonging to someone – when they finally earn the keys to their very own home. P.S. 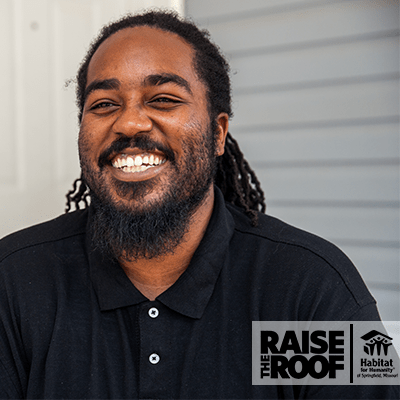 This is your last chance to meet this Raise the Roof Giving Opportunity with an online gift. It’s so easy to make a positive impact on families who need you. Please share your gift today!